London - Oscar Pistorius made a triumphant return to the track on Wednesday night, winning gold with his South African team-mates in the men’s 4x100m relay and setting a new world record at the Paralympic Games in London. "It’s easy to be gracious when you win, but to be humble when you lose is not as easy - and I’ve had to learn that," Pistorius said after bouncing back from his 200m upset last week. The relay team clocked 41.78 seconds, knocking three-quarters of a second off their old T42/46 record of 42.50, which they set in February. "We came out here to break a world record and we smashed it," Pistorius said. "In the call room everyone else was excited, jumping up and down, but our team sat there quietly. We each knew what we had to do and it makes me so proud to be a part of this team, with these guys." Samkelo Radebe, Zivan Smith, Arnu Fourie and anchor man Pistorius set the stadium alight as they exchanged batons -- in the form of an arm tap --leading each leg of the race. "We each had a quarter of a job to do and Samkelo got off to an amazing start. 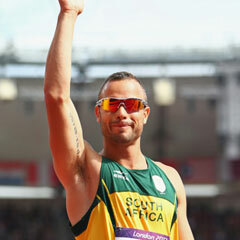 Zivan held his own in the longest leg of the relay -- he just did what he had to do," Pistorius said. "Arnu came home with me in a great run and it’s just a blessing to have had that opportunity to step out here and fulfil our dream." Brazil’s Alan Oliveira was close to catching Pistorius on the line, but the Blade Runner’s determination won through in the end. "I knew we had to get the baton before Alan, because he’s just so quick and I wouldn’t have been able to stick with him," Pistorius said. "My goal was just to run the hardest last 100m that I possibly could and I just kept my head down and dug as deep as I could." As it turned out, the Brazilians were disqualified for not touching the baton within the take-over zone, as were the Americans -- who finished in third place -- for running out of their lane. China’s team jumped into second place in 42.98 and Germany celebrated a medal position with their time of 45.23. A contrite Pistorius said it had not been easy walking back into the stadium after Sunday’s controversy, where he lashed out at athletes using longer blades immediately after his shock defeat by Oliveira in the 200m T43/44 final. "I’ve got a gold medal now and I’ve got my silver from Sunday," he said. "I’ve had a look at my silver medal and it’s pretty beautiful and I regret what happened after the 200m on Sunday. "The timing of my comment wasn’t great, and I’ve had to deal with the backlash. "Although I was the first person to bring up the topic, and I got lashed very hard for it, there have been so many athletes who have spoken up over the last two days. "It shows it is a huge problem, but it was distasteful of me and I realise that now. I’m sorry for it, but I do make mistakes." Pistorius said it was not easy to return to the track and he was worried about the reaction of the crowd when he stepped out into the packed stadium. "It wasn’t easy coming out here today..., but I learned, and that’s the beauty of life. "I’ve apologised to Alan and tonight was an amazing opportunity for me to come out and get over that. "The reaction from the crowd was unbelievable and it really is special and extremely humbling knowing how much support I have. "The people here are so passionate and sometimes you make mistakes and they understand that, and it was really lovely to be back out here tonight and feel that vibe again."